Introduction: Since ICAST 2007 our email boxes and discussion forum have been full or requests for review on a particular product. This product was touted as being the first in the industry with bio-fibers integrated into the blank to supplement the graphite at a time when graphite supplies were growing more and more scarce. The market was ripe for an alternative and the fact this company had researched and resourced a material that was green further heightened excitement and expectations. Of course, we are speaking of none other than E21�s Carrot Stix. 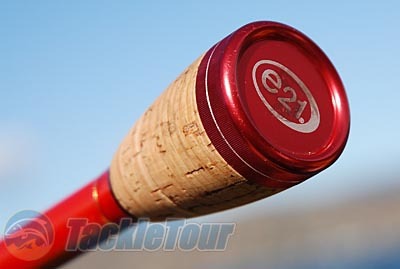 Shortly after ICAST 2007 we were sent several sticks from E21 for review. These were the first to be released E21 Carrot Stix LTX rods, a more cost conscious series built with foam grips and Pac Bay guides. We were well on our way to completing our evaluation of these rods and expected to have an article up in Q1 of 2008, but when we made E21 aware of some quality control issues with the rods they sent, the product was set aside as being part of their prototype batch and not truly representative of production. We do not write reviews on prototype products, especially not rods and reels because there often are differences between prototypes and final production rods, so when we were made aware of this fact, we put the product on the backburner until we were able to procure official production run review specimens. 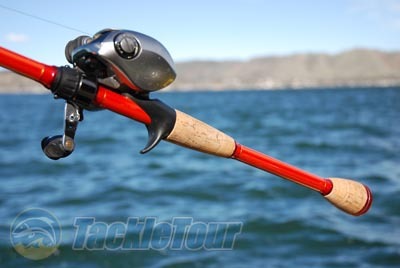 During this time, we were made aware that the original composition of the rods, demonstrated at ICAST 2007, never made it into real world product. The carrot fiber technology they had relied upon from Cellucomp did not bond well with the underlying blank material and became friable compromising the strength and integrity of the blank. The blanks E21 uses now are supposed to contain some other type of bio-fiber, but they are not discussing what the origins of these ingredients may be. At ICAST 2008, E21 unveiled their new, 21 Carrot Gold series, complete with a glossier finish on the rods, a step up in guide materials, and a blank that was designed to be higher performing. The rods looked more polished than the originals but as always we reserve all final judgment until we can get the product out on the water. Then came 2009 and the announcement of our Year of the Crank roundups. E21 stepped up to the plate and sent in an official, production batch, review specimen. We�ve fished this stick for over 6 months and finally, after a nearly two year wait, here is our first official look at the E21 product. 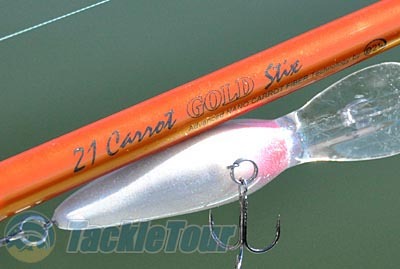 Presenting our review of the E21 21 Carrot Gold Stix 21CRG701M-M-C.
Impressions: Aside from the bright gold-orange of the 21 Carrot Gold Stix, the first thing most people will notice when picking up the rod is the weight, or rather the lack of it. The 21 Carrot Gold is amazingly light measuring in at only 3.6 ounces. 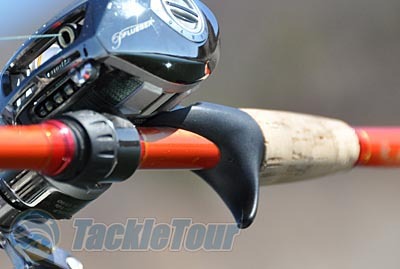 The rod has no foregrip and instead has a very similar designed reel seat from the Airrus rods which exposes much of the blank, and makes use of cork instead of the heavier Hypalon material. 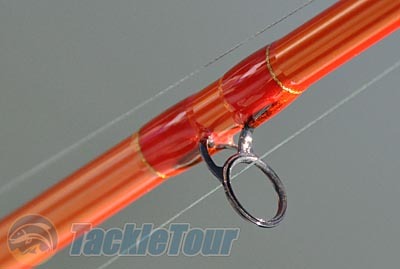 The guides on the 21 Carrot Gold Stix look better than the LTX rods but it appears that they are just coated TiCH black. The guide frames are double swaged so they do a better job at keeping the guide inserts in place. Overall the rod did look more polished than the original and we were eager to see how the rod would perform in the lab and in the field. Lab Tests: Finally with the production model we are able to get some accurate lab measurements as we RoD WRACKed the 21 Carrot Gold Stix. 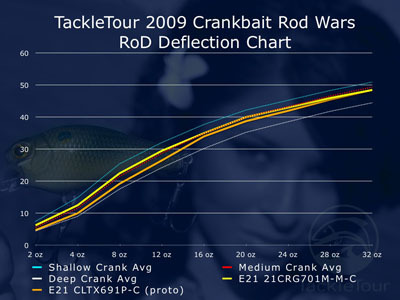 From the lab results we saw that this e21 rod exhibits the proper action to be an all purpose cranker handling shallow to deep crankbaits, though the sweet spot would be for medium divers that run between six to twelve feet deep.